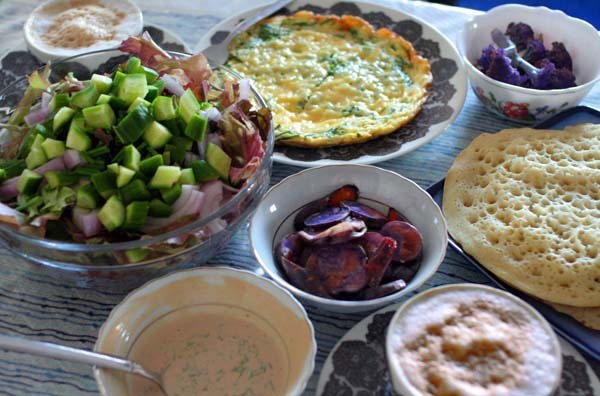 This Saturday brunch included fresh-baked lahoh, a purple salad with ginger-dill dressing, a cheese-herb omelet and a random assortment of roasted purple vegetables. The lahoh was great, and is noteworthy because I don't think many recipes for this Yemenite pita appear in English (although I found a few hits under the spellings laxoox, lahoch and lachoch). We ripped off pieces and folded them around bites of omelet. The salad dressing was also quite nice. The purple vegetables were part of the surplus that is purple food week. The rest was good, but relatively standard for a brunch. I decided to make lahoh (×œ×—×•×—), a soft, pan-baked Yemenite pita, mostly because we didn't have any other form of fresh bread in the house, and the recipe I know is relatively quick. The recipe came from one of my former roommates, who didn't make lahoh herself but got the recipe from her grandmother. Something must have been lost in translation, because the version I got called for half a box of baking soda. The first time I made lahoh, I followed the recipe word-for-word, and it turned out to be a recipe for disaster, pun intended. In any case, I adjusted the quantities to create a better-tasting result this time around, while maintaining the general spirit of the recipe. Keep in mind when adjusting the quantity of water that your pitas should not be coming out too thick or too stiff -- they should be soft and flexible like pancakes, elastic and full of bubbles. If they're not, you probably need to add a little more water to your batter. These quantities make 4 to 5 pitas. 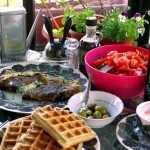 Most recipes work with a full kilo of flour, or 4 times this amount, but this was more than enough for a brunch for two. Mix the ingredients together. Let the batter sit for at least 30 minutes; bubbles should appear on top. Stir to "knead." Let sit some more. Ladle cupfuls of batter into a very lightly greased non-stick pan on a medium-high flame. 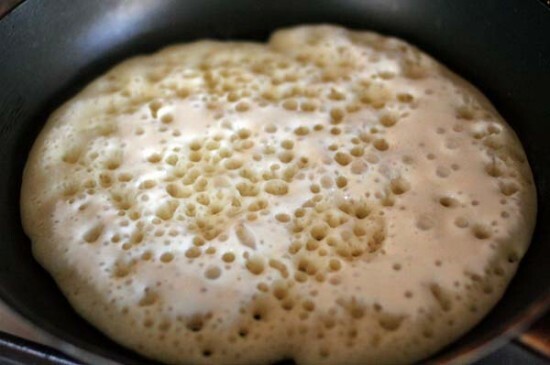 Bubbles should start appearing on the surface of the batter, as in the photo above. 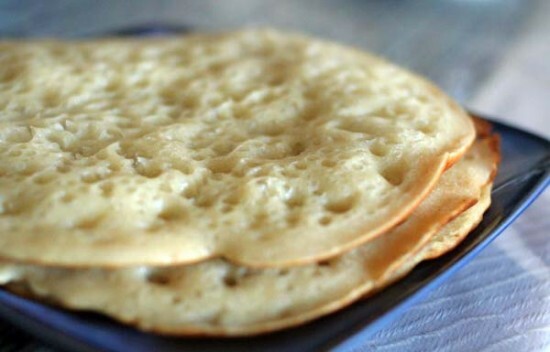 When the batter is dry on top and fully covered in bubbles, cover the pan with a lid for about a minute and turn down the flame so that the pita doesn't burn. Remove from the fire and repeat. I enjoyed the flavor of this salad dressing, which was reminiscent of the salad dressing I get at my favorite lunch place, Genia, across from the office. However, there they add pureed onion to their dressing, and don't use ginger. Mix together. 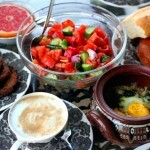 For a more healthful version, use yogurt or buttermilk instead of mayonnaise. We made our salad out of red lettuce, purple onion, chives, cucumber, as well as a few purple cauliflower florets. It was quite pretty. This omelet contained 3 eggs mixed with chopped chives and parsley, topped with a few slices of gouda cheese. Nice, but your standard omelet. Aside from the coffee, we had side dishes of roasted blue vitelotte potatoes sprinkled with kosher salt, and roasted purple cauliflower. The cauliflower was as nice as roasted cauliflower usually is, but this may not have been the best way to prepare these potatoes, as it failed to bring out the nutty taste they're supposed to have. Luckily, the box is still mostly full. 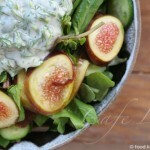 7 Responses to "Saturday brunch: Lahoh, purple salad with ginger-dill dressing and more"
Used the ginger dill dressing on a veggie salad with spring greens and WOW was it good. We added some olive oive oil and water to thin it out. Thanks for the recipe!! Great, glad you liked it! I hadn’t made that dressing in a while, until you reminded me.